Jonathan Walters, who announced his retirement from football on Friday, has said that the atmosphere in the Ireland camp changed after Roy Keane's infamous training ground row with Harry Arter. 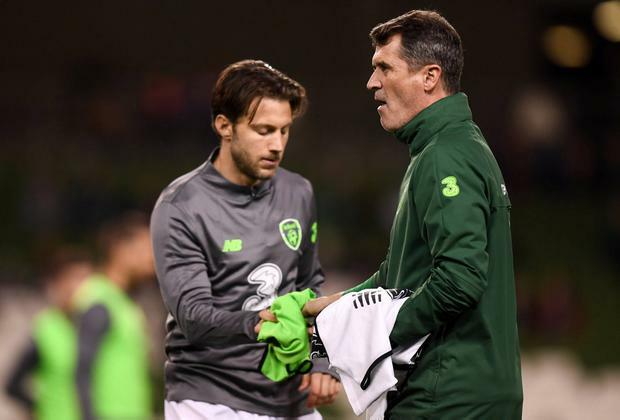 The former Ireland assistant boss was involved in a furious bust-up with Arter last summer, with the Cardiff midfielder taking time away from the set-up afterwards. He missed September's matches with Wales and Poland but opted to return after holding discussions with Keane. Following the incident, a WhatsApp audio emerged of Stephen Ward describing what happened and speaking on Virgin Media One tonight, Walters aid Ward's version was "mild". "The atmosphere changed, results don't help, we had a year of not winning but the atmosphere was definitely different from when I first met up. "My Mum's from Dublin. Every time we weren't in school, we were in Ireland. "It's quite a hard thing to say when you used to absolutely love meeting up, always look forward to it. You used to love coming to meet everyone and being involved and being able to play for Ireland, it's an unbelievable feeling. "But then the past year that sort of changed for a lot of people, the atmosphere went right downhill. "It was difficult, you could probably go into a lot of things, it's not the best time to go into it but we all know that WhatsApp have a lot to answer for with Stephen Ward and that was probably a mild version of what happened. "There were various things like that so that changed a bit of perspective on it." On his retirement, Walters added: "From very early on... I have an English accent, I was born in England but my Mum's from Dublin, from Ballybough, and every time we weren't at school we were over in Ireland. "We spent Christmases here, Easters here, summers here. "It's what I wanted from a very young age. I got into the Academy system quite late as a player, 15 or 16. "I had an exceptional first year. I think I was the top scorer in England for my age group and I got asked what I wanted to do and that was my answer straight away. "I was involved in the Under-20s and Under-21s, I didn't get back into it until quite late, 26 or 27. "From a personal point of view it means everything. That's the most difficult thing I'll find, I think, looking back going through any photos, watching any videos, that's the most difficult thing, the Ireland side of it. "I can park club football to the side believe it or not, the Irish side of it is one thing I will miss massively." Ewan MacKenna The beginning of the end? Ronnie Esplin The Scottish Football Association is on the hunt for a new national team boss after McLeish was sacked on Thursday.